Luxurious Tuscan Jereford model in prestigious Saratoga Farms. 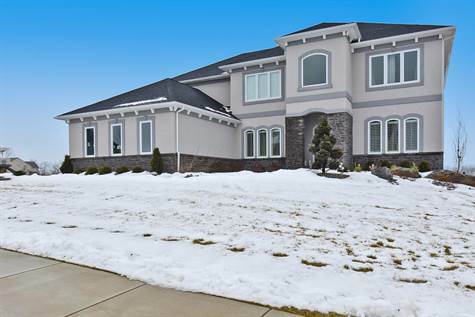 This open concept home starts with a stunning 2 story entry flanked by a formal dining room and office. With voice controlled lights throughout along with Alexa controlled HVAC and a ring doorbell. No expense was spared in this gourmet kitchen. Top of the line Wi-Fi Jenn air appliances accompany custom cabinets and beautiful quartz counter tops with a huge center island. The 2 story great room features a gas fireplace and floor to ceiling stonework. A first floor bedroom with an en suite bath rounds out the first floor. The master bedroom features trey ceiling and quartz counter top and a Jenn Air fridge. A large walk in closet with built ins create an ideal closet. The master bath includes an over-sized shower with dual heads. A deep jetted tub in between his and hers quartz vanities. The 3 other bedrooms upstairs are sound proofed and have walk in custom closets. This home was built beyond builder standards.